Discarding the Bishop allows you to name a number and a player. If the player has that number in their hand, you get a Token of Affection. If this would give you enough Tokens to win the game, then you win immediately and the game ends. 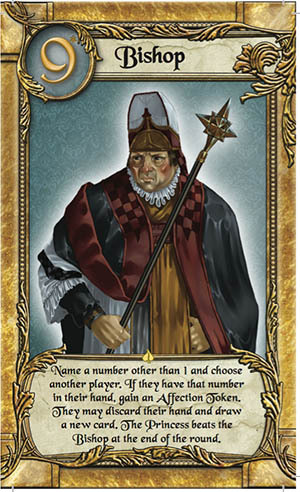 If you gained a Token of Affection from this effect, then the player whose card you effectively revealed with the Bishop may discard their card (but doesn't apply its effects, unless it is the Princess, see page 8) and draw a new one. At the end of a round, despite his impressive 9, the Princess still beats the Bishop when comparing the values of cards in players' hands. He is considered to have a value of 9 for all other game effects, however. Mother to King Arnaud, the dowager Queen Mother Tummia was devastated by the arrest of her daughter-in-law, Queen Marianna. She now focuses her attention on her granddaughter, Princess Annette, in whom she sees much of the deposed Queen. 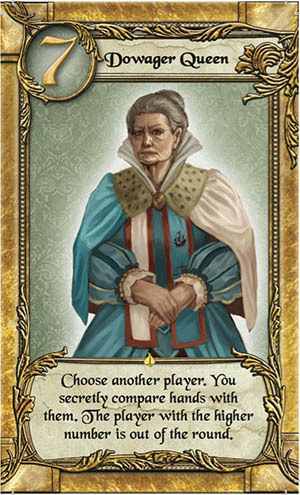 When you discard the Dowager Queen, choose another player still in the round. You and that player secretly compare your hands. The player with the higher number is knocked out of the round. In case of a tie, nothing happens. Because the security of the royal court ultimately rests in the hands of Constable Viktor, it was his decision to arrest the Queen for high treason. Now, as the weight of his duty bears down on him, he is determined to see no harm befall the young Princess. 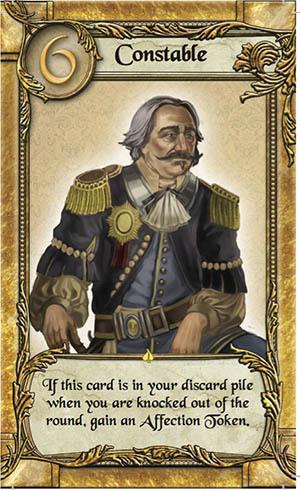 The Constable is a somewhat unusual card, insofar as its effect applies not when discarded, like most cards, but when you are knocked out of the round with it in your discard pile. Should this happen, show the Constable, then claim a Token of Affection. If this would give you enough Tokens to win the game, then you win immediately and the game ends. 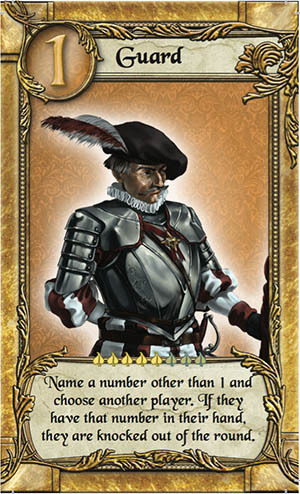 An ambitious man, the wily Count Guntram is careful to offer his support to whomever he believes is most likely to benefit his own interests in court. Once he has made his choice, though, his loyalty is certain, as he continues to work behind the scenes on his chosen patron's behalf. When the round ends, if it is necessary to check the number in the players' hands to determine a winner, the Count will increase that number by 1. 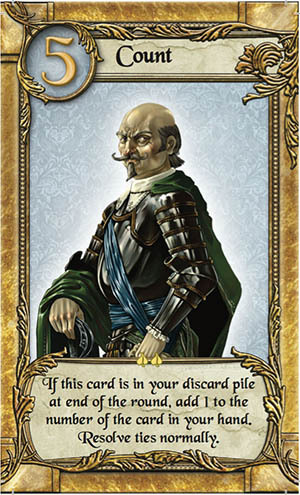 Note that this stacks, so if you have both copies of the Count in your discard pile, the number will increase by 2. 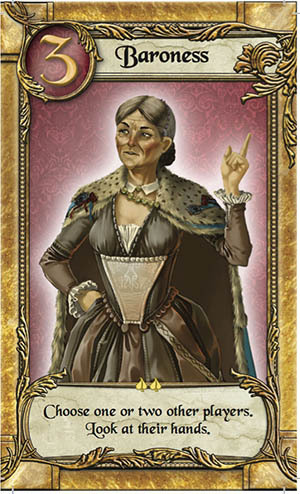 In this case, the cards with a number of 7-the Countess and the Dowager Queen-would beat the Princess. If increasing the number of the card in your hand with the Count would result in a tie for highest number in a player's hand, then resolve ties normally, by adding the numbers of the cards in the discard pile of each tied player and comparing the totals. The Sycophant is a true opportunist. Obsequious to the point of groveling, he will do almost anything to gain favor from more powerful and influential courtiers, then seek to use that favor to further his own standing in court. When you discard the Sycophant, choose a player (including yourself). 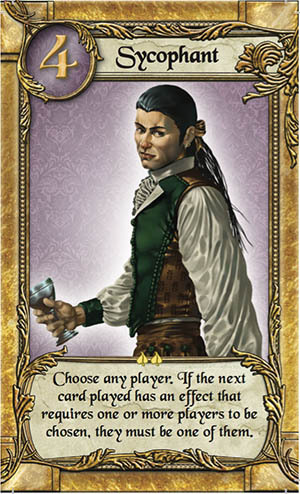 Then, as long as the next card played has an effect that chooses one or more players, it has to at least choose the player you chose with the Sycophant. While Baroness Fiona is seemingly content to remain in the political shadow of her husband, Baron Talus, this is really a ruse. Fiona has a keen mind for courtly intrigue, and will take firm, albeit discrete action as she sees fit, regardless of whether it aligns with her husband 's interests. When you discard the Baroness, you can look at the hands of either 1 or 2 other players. Do not reveal them to any other players. 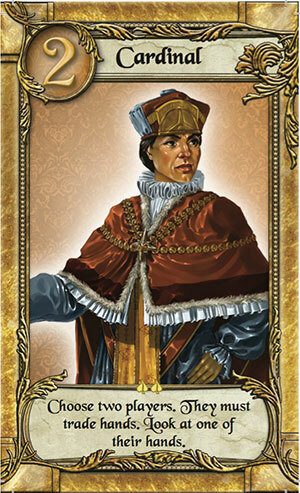 A devout and notoriously uncompromising man, Cardinal Vesper would see the Princess married to an "appropriate" suitor-and as soon as possible, at that. The girl 's happiness is certainly a consideration, but stabilizing the royal family and its succession in the wake of the Queen's alleged treason is what matters most. When you discard the Cardinal, choose exactly 2 players (you may include yourself), who will switch hands. Then, once the hands are switched, you may look at one of them without revealing it to any other players. If less than 2 players still in the round can be chosen, (eg. due to Handmaid or Sycophant), this card is discarded without effect. Dour and uncompromising, Dougaul is every bit as committed to the security and well-being of the royal family as Odette, his fellow Guard. He has an abiding, almost fatherly fondness for the young Princess, though, and will cast a wary and searching eye on any suitor seeking her favor. When you discard the Guard, choose a player and name a number (other than 1). If that player has that number in their hand, that player is knocked out of the round. If all other players still in the round cannot be chosen (eg. due to Handmaid or Sycophant), this card is discarded without effect. Although often seen in court, Jester Darius is a mere entertainer. This might seem to suggest his influence is negligible, but like many of low station who work in the royal court, Darius is largely invisible to the powerful courtiers around him. As a result, he sees and hears much more than most realize, giving him a potent sort of influence of his own. When you discard the Jester, choose another player-ideally, the one you believe is most likely to win the round. 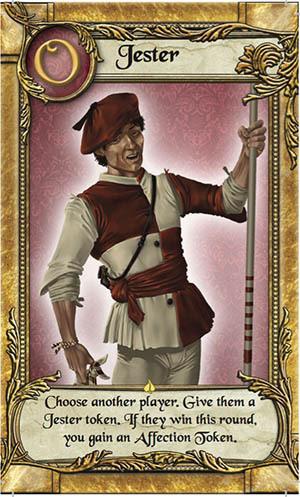 It's helpful to place the Jester token provided in the game near the player you chose, so everyone remembers your choice. If you're correct, and your chosen player does win the round, you gain a Token of Affection. If this would give you enough Tokens to win the game, then you win immediately and the game ends. This is a card whose effect only applies while it is in your hand. If another player chooses you when playing a Guard, then regardless of what number that player named (even 0! ), when you reveal the Assassin (to all players), the Guard 's player is eliminated from the round, while you are not. Of course, all other players will now know that you have the Assassin in your hand. 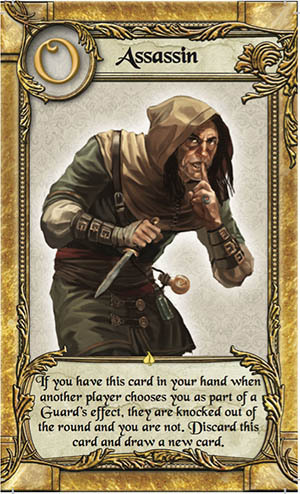 It would be both improper and dangerous to keep consorting with such an unsavory character, so after you've resolved the Assassin's effect, you must discard him and draw a new card. If the deck is empty and you cannot draw a card, then draw the card that was removed at the start of the round.